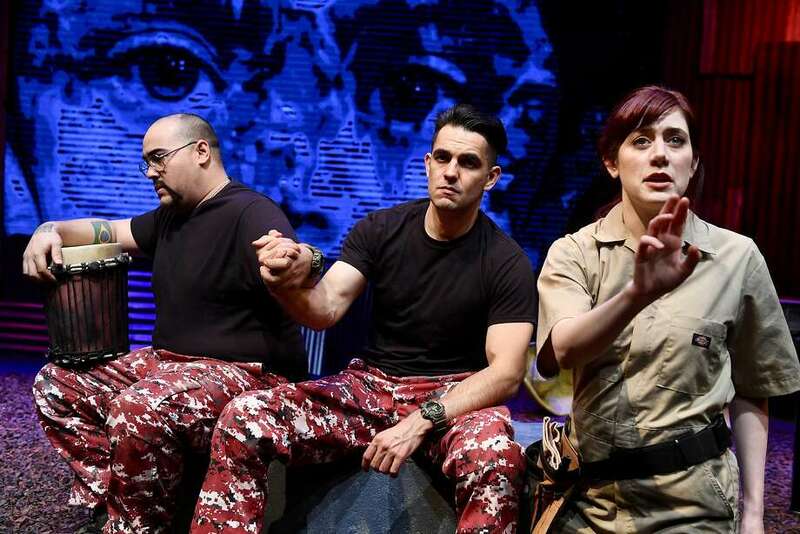 Set on an army base in Afghanistan in 2016, “The Memory Stick” by Irish playwright Donal O’Kelly, tackles some serious issues of right and wrong and moral obligation of soldiers when they see something unethical. The Memory Stick is a world premiere co-production between The Stage www.sanjosestage.org and the Arts Office of Dublin City Council, Ireland. Two Native American soldiers Seth Shaw (John R. Lewis) and Jack Black Horse (Joseph Valdez), occasionally joined by Bridget (Lindsy Kail), begin a makeshift lodge while on an army base in Afghanistan. Each of them relive their earlier memories and share ruminations that are deeply tied to their cultural identity. One of them has recorded some illegal data onto a memory stick about army’s unethical behavior and the discussion soon veers into the realm of morality and whether or not they should publish/leak this information. The discussion weaves in many threads including systematic oppression of the Native Americans and events surrounding Wounded Knee as well as oppression of the Irish people and uprisings in Ireland. There is also a segment on Bradley/ Chelsea Manning that portrays Manning as a lonely hero. This is an ambitious and bold play oddly reminiscent of Dostoevsky’s Crime and Punishment and takes the audience into deep recesses of morality and ethics. Is the true mantra for soldiers, “theirs not to reason why, theirs but to do and die” or as soldiers in the bigger journey of life, do we all bear responsibility to question the wrong when we see it, that every person can, as Bridget quotes from James Connolly, do “his duty according to his lights”? This play is about human soul and whistle blowers and how it puts someone concerned with doing the right thing sometimes in an incredibly lonely spot. Indeed the play tackles too much and leaves the audience a bit rattled as well as unsettled. It is heavy on dialog and while that can put you to sleep at times, yet under the chaos of multiple issues are larger questions about life and morality that are guaranteed to keep you awake at night. Irish and the Welsh dialect is enjoyable and staging by Tony Kelly is sparse but perfect. For tickets, please go to www.thestage.org .